Black leaders trying to quell rioting in a St. Louis suburb, where police shot dead an unarmed African-American teen, fear the presence of the Rev. 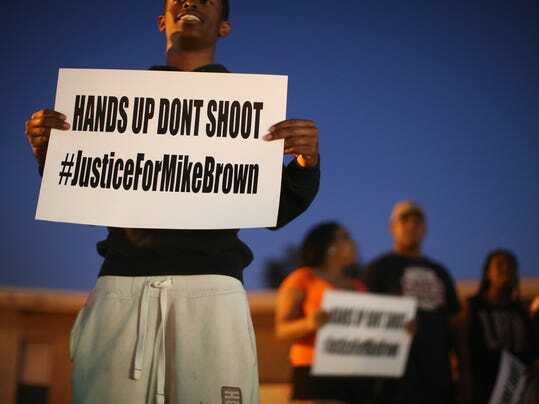 Al Sharpton will hurt their efforts, James Knowles, the mayor of Ferguson, Mo., told Newsmax TV. Michael Brown, 18, was shot multiple times on Saturday by an officer whom authorities have declined to identify because he is not charged with a crime. The shots were fired after Brown reportedly got into an altercation with the officer, who had stopped Brown and another man as they walked along a street. The shooting has sparked days of rioting, looting and several stores being set on fire. One woman was critically wounded when she was shot in the head. Dozens of rioters have been arrested and the Justice Department has sent its Community Relations Service to the area in a bid to ease the racial tension. "We're at a point now where we think we've achieved a level of safety in our community and restoring things back to a relative normalcy and we really have to do that so that we can sit down and talk about these things,'' Knowles said. Sharpton arrived in St. Louis on Tuesday and walked arm-in-arm with Brown’s family members, their lawyer and clergy members. The controversial civil-rights leader and MSNBC host then made a fiery speech to a crowd at the city's historic Old Courthouse. "St. Louis is in fact bearing witness for America," Sharpton said. "The Band-Aid has been ripped off, and all of America is seeing the open wound of racism exists." Knowles insisted the community is strong and will get through the trauma of the tragic killing. "We want people to know that we're a strong community…. Everybody sees these things on TV and other areas and imagine that it can't happen here, especially a small, quiet suburb of St. Louis. It is shocking,'' he said. "Our community has been very diverse for a long time. I grew up here, I attended a high school that was majority African American at the time and it's gotten more so, but I never saw racial violence at my school. "I never saw the frustration or the anger between the races. We are a very cohesive group.